Naperville’s Tease Dance and Fitness will be helping to raise money for breast cancer research on Saturday, October 8. That is the date of the pole dance studio’s fifth annual pole-a-thon. Students and instructors will perform in 20-minute increments as they dance for a cure. Dancing begins at 6pm and will go to around 10:30 p.m.
Friends and family are invited — including men. This is the ONLY time in the year that we let the men into the studio! Everyone in attendance must be over the age of 18. Donate something to the silent auction…Remember to ask local businesses and friends. They will get advertising exposure to hundred’s of people that evening. Men and Women! A few ideas if you have a contact are, spa packages, concert/sporting tix, hotel overnight packages, handmade items, etc. If you’d like to help out participate, you can contact Dana B. at Danab4tease [at] gmail [dot] com. 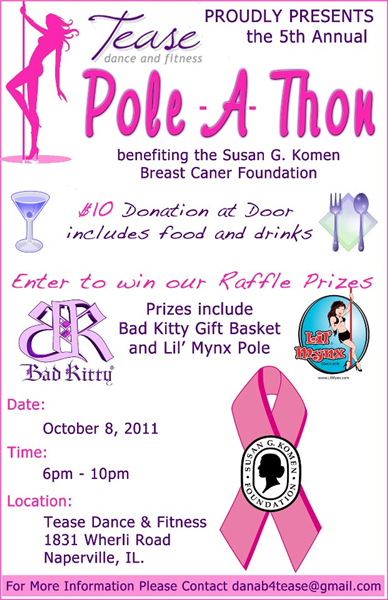 Tease Dance and Fitness will be holding its 3rd annual Tease Dance and Fitness Pole-a-Thon on Saturday, October 10. Stay tuned to TeaseDanceandFitness.com for more details.